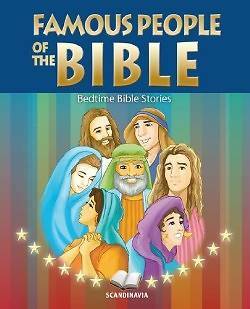 A book for children ages 2-5 that tells the story of some of the most well-known people from the Bible. With simple words and colorful illustrations, this book shows the smallest kids why these biblical characters are famous. Included are stories about Noah, Abraham, Moses, Jacob, Joseph, Moses, Joshua, Gideon, Ruth, Hannah, Samuel, David, Solomon, Elijah, Esther, Daniel, Jonah, Mary, Jesus, John the Baptist, Mary Magdalene, Martha, Zacchaeus, Paul, and Peter.